Professor Janet Horne, inaugural Director of European Studies is pleased to announce the launch of a new Interdisciplinary M.A. degree in European Studies at the University of Virginia. 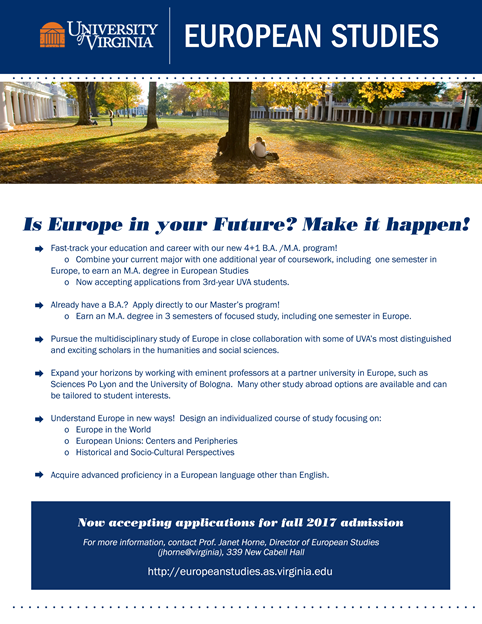 Is Europe in Your Future? Make it Happen! The M.A. in European Studies--with a 4+1 B.A./M.A. option-- trains students to think across disciplines and cultures and apply a diverse array of methodologies to the study of Europe in a global framework. This program offers an intense, scholarly environment--including one semester of study in Europe-- that will challenge students and position them to be more successful in finding their place in the global workforce. Now accepting applications for fall 2017 enrollment.